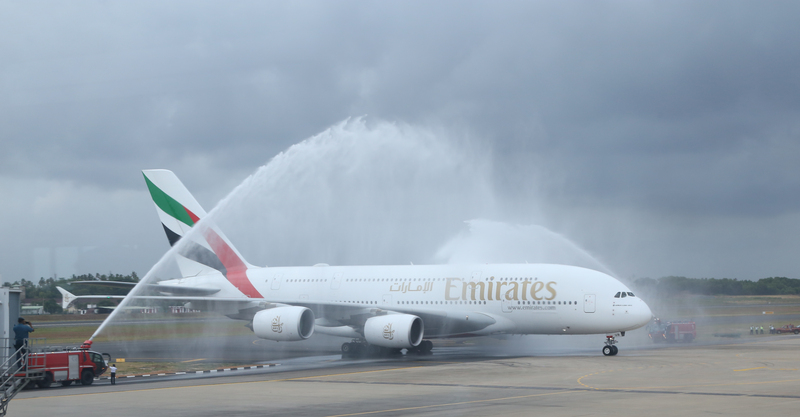 An Emirates A380 aircraft landed at Bandaranaike International Airport (BIA) Katunayake today, helping Sri Lanka and the airport achieve an aviation milestone. Sri Lanka’s Minister of Transport & Aviation Hon. Nimal Siripala de Silva M.P. was at the airport to greet H.E. 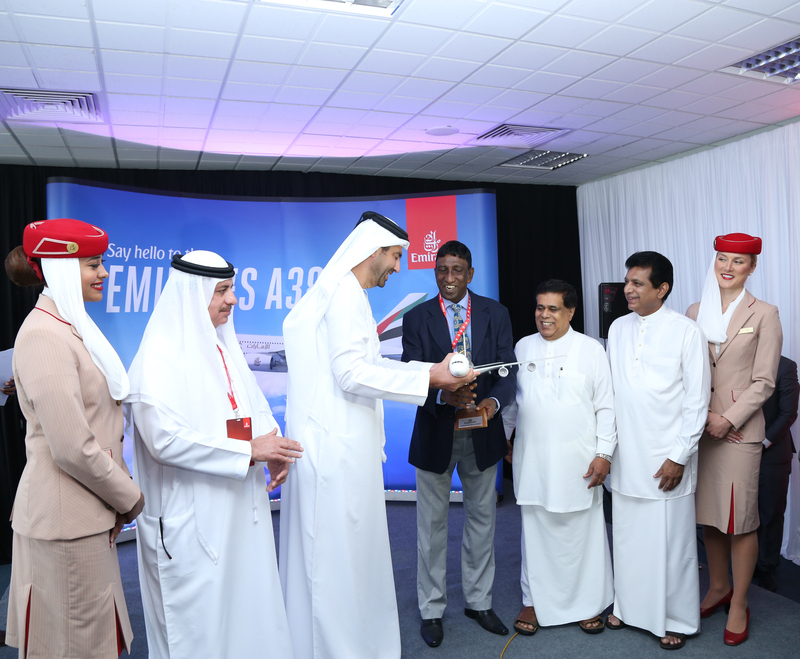 Abdul Hameed Abdul Fattah Kazhim Al-Mulla, UAE Ambassador to Sri Lanka and Emirates’ Senior Vice President Commercial (West Asia & Indian Ocean) Ahmed Khoory who were among the VIPs on the flight, the first A380 commercial flight to the country. Arranged to celebrate the BIA’s recently resurfaced and upgraded runway, the special one-off A380 flight operated as EK654 from Dubai, replacing the B777 aircraft usually deployed by Emirates on flights to Sri Lanka. The iconic aircraft was on ground for more than six hours to enable airport executives, VIPs, trade partners and media to enjoy guided static tours of its cabins and unique amenities like the First Class Suites, Shower Spas and the On-board lounge. “For the BIA, this event signals that it is ‘A380 ready,’ and that the world’s largest A380 operator – Emirates – has already operated a commercial flight. Given the Sri Lanka government’s focus on developing tourism, this is an important development. For local aviation enthusiasts it is a matter of pride that their airport has joined the ranks of leading international airports in the A380 league,” he added. In service for nine years, the Emirates A380 remains the most talked-about passenger aircraft in the world today. Emirates is the world’s largest A380 operator with 96 aircraft already in its fleet and a further 46 on order. The award-winning airline currently operates A380 flights to 48 destinations, almost a third of its global network. Since 2008, Emirates has flown over 80 million passengers on its A380 fleet. On the Emirates A380, First Class passengers can relax in one of 14 flat-bed, massage-equipped Private Suites; the cabin also has two exquisitely designed onboard Shower Spas, ensuring a revitalised and refreshed arrival. For First and Business Class passengers the on-board lounge is the social highlight, featuring a fully-stocked bar and a selection of hot and cold canapés. Business Class passengers can relax in seats that convert to flat beds up to 87 inches (two metres) long, whilst those travelling in Economy Class can stretch out in seats with a pitch of up to 33 inches. Customers in Sri Lanka can experience Emirates’ double-decker aircraft by connecting through the airline’s Dubai hub when they travel to A380 destinations in North and South America, Europe, Australia and New Zealand, the Middle East, Russia, and the Far East. Emirates commenced operations to Sri Lanka in April 1986 and operates a total of 34 flights a week from Colombo — 27 flights westward to Malé and Dubai and seven eastward to Singapore connecting onwards to Melbourne, Australia.